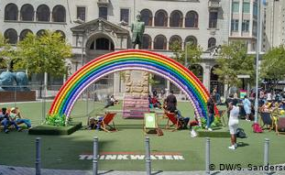 A public awareness campaign across Cape Town was launched in 2018 to save locals from "day zero". Candlelit dinners are rather commonplace in Cape Town these days - but not for romantic reasons. The city is in the dark because of power cuts. Since the beginning of the year, South Africa's national utility provider Eskom has been rationing the supply of electricity frequently in a bid to ensure that a total system outage doesn't occur. To many Capetonians, this practice of load shedding brings back memories from last year, when the town on the Cape of Good Hope was hit by the worst drought in its modern history. The water crisis brought the city to the verge of taps being turned off altogether - a prospect, which at the time was referred to as "day zero." "Capetonians are just exhausted. We're tired of being in crisis mode. From having no water to this energy crisis. It's just exhausting to always have to be prepared for something," Claudia Smargiasso, a digital marketing strategist, who lives in the touristy Cape Town suburb of Blouberg, told DW. "The only difference between the two is that the water crisis never switched off. It was constant. With the load shedding situation, we at least know when the power is going to be cut, so we can plan around it. But there's no planning around a drought. It just hits you." "People here have adjusted to how they work with water. Even though the water restrictions were lifted last year, it's now become our new way of life. And it had to because we don't know when the next drought is going to hit us. This has always been a water scarce area, but at this point it's not a case of if but when there will be another water crisis." While locals have had months to adjust to Cape Town's new reality, tourists and visitors may have had a hard time embracing that new way of life; Smargiasso points out that many people no longer fill up their pools at home anymore because "they just realize that it's such a waste" - while tourists still expect a comfortable stay during their travels to the city. "My parents came for a visit last year, and they didn't quite understand the urgency of the situation. And some people don't quite seem to process what it means to not take a real bath for months and just showering for two minutes instead." Jeff Levy, owner of "Head South Lodge" in Cape Town's central Three Anchor Bay neighborhood, says that bookings at his hotel had declined severely during the height of the drought: "The hospitality industry, restaurants and retail all really suffered last year. My own business suffered and my colleagues also complained about the same," Levy told DW. "Our numbers are now very much up on the previous year. That's very encouraging. I can't say that we're completely back to (what it was like) before but it seems that at least some of the people, who wanted to come here in the past year but didn't because of the water crisis appear to be coming now instead." Levy points out that he has kept advisory notifications in his hotel rooms with regard to saving water, but has removed some of the accessories used for dealing with last year's drought - such as keeping buckets in showers to catch grey water to later be used for flushing the toilet. "Tourists expect a certain amount of comfort and keeping those buckets in place for example would be a bit excessive I found, so I took them out." He further says that tourists have in the past asked him - before making a reservation - whether the taps had literally dried up in Cape Town. "Those scare tactics about day zero really worked for Capetonians, they brought Cape Town together and set a great example for the rest of the world on how to manage a crisis situation like this. But they also went around the world and really scared tourists, which really affected not just our business but many other enterprises as well." Western Cape Premier Helen Zille meanwhile is confident that Capetonians have learned their lessons from last year's crisis and that the area is well on its way to bouncing back: "I can't think of any region of the world that has turned around a crisis of this magnitude so quickly. In fact, there is no longer a water crisis," she told DW. However, she also cautions locals to remain vigilant when it comes to water management - in line with the current level 3 water restrictions, which means a daily limit of 105 liters per person. If a household goes over this per-person-limit, which is monitored closely per building, fines are issued. "We have to continue the water-saving behavior. We can't just relax and become complacent because climatologists tell us that climate change has made the weather more difficult to predict, and so we don't know when there will be another drought. So, saving water has become our number one priority. "Ultimately we'll have outstanding water resilience, with an educated public who understand why it is important to look carefully at water use," Premier Zille said. Claudia Smargiasso agrees with the premier's outlook, saying that a lot of the recommendations to save water (such as installing rain water collection tanks) have stuck: "People were also quite happy before the crisis to spend a lot of money on their gardens, but now they've divorced themselves from the idea of having acres of rolling lawns. But those are first-world problems. "You see, the water situation is very selective as to whom it actually affects. Those who are at the bottom of our society here were always used to getting by with just one bucket of water a day. To them, it's like: what water crisis?"